In the main office of the Coleman Elementary School hangs a painting of William Tell Coleman. The 19th-century businessman was a spirited developer of San Rafael and the Magnolia Valley that became Coleman Park or today’s Dominican neighborhood. And through the years of three successive school facilities spanning more than a century, this K-5 school has honored the name and legacy of W.T. Coleman, aka Mr. San Rafael. In 1909 the San Rafael School District gained title to the land on which Coleman Primary would be built adding to the title lineage that spanned Geo. D. Schearer (1909), Mackay & Flood (1907), W.T. Coleman (1871) and the Rancho Santa Margarita y Las Gallinas through Timateo Murphy of San Rafael’s pioneer days. The Coast Miwok Indians had been the first caretakers of the land, its creeks, valleys, hills and streams for thousands of years. By August 1919, the district’s first kindergarten was opened at the Coleman School. Two years earlier, thirty-nine San Rafaelites petitioned the Board of Education to approve such action. Five months after its launch, the Board characterized the Coleman class as “thriving” in support of a measure to establish a second kindergarten at the Short School. In 1936, school efforts to reap a technological edge were newsworthy. The June 11th Marin Journal reported: “Because of the importance of the radio in modern life, the school is endeavoring to create in the children a good taste in the selection of a radio program. The auditorium is equipped with a radio. A central control system with wired receivers in each room is provided. The entire school can listen to a program without leaving their rooms.” Sixty-eight years later Coleman Elementary would make computers a priority in K-5 classrooms. By the early 1940s, the California State Highway Department was working to extend the 101/Redwood Highway through San Rafael and thereby reduced the play area for children at Coleman. Given the untenable situation, the state purchased the Linden Lane/Grand Avenue site enabling the school district to purchase land and build a new school on what was then Watt Avenue off of Belle Avenue. Plans to open in the fall of 1941 were accelerated to early May due to the State’s demand for abandonment of the old school. A sixth-grade room was added to the facility in 1957 and another six classrooms opened in 1960. Over sixty-two years, thousands of students graduated from the second Coleman Elementary amidst an array of educational, cultural and community affairs. A farewell yearbook, Coleman Elementary School 1941 – 2003: A Collection of Memories highlights but some of the “happenings” that made a school a community: PTAs, Workday Crews, Yo-yo Championship Awards, Field Trips & Field Days, Sock-Hops, Fairs, Pageants, Safety Patrols, Music Festivals, Plays, Author Festivals, Book Fairs, Drama, Outdoor Education Journals, Walker Creek Ranch Week, Academic Chess Club, Coleman Daycare Center, Creative Writing Club, Published Poets, Cooking in Room 15, Coleman Coffee House for Young Poets & Writers, TeachEach Awards, Rummage and Pastry Sales. With their school deemed beyond repair and renovation, the San Rafael City School District raised funds through two bond measures, state funding and contributions from the Coleman PTA to cover the $14 million price tag to build a state-of-the-art facility. Like its predecessors—as well as the man whose name the school carries—this school would break new ground: being among the first schools to be built in Marin County in a quarter century. The Coleman Elementary School at 800 Belle Avenue honors the name and memory of “Gilded Age” businessman and developer William Tell Coleman. Born in 1824 in Cynthiana (Harrison County), Kentucky, he came to California during the Gold Rush seeking fortune not by wielding a pick and axe in the Sierra Nevada, but by selling tools, wares and other supplies to “49ers” in Sacramento and Placerville before moving to San Francisco. 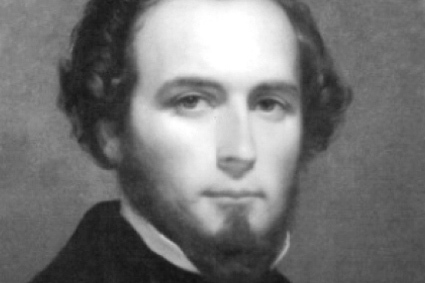 Coleman’s mercantile efforts were a success and in 1856 he began operating steamships from New York to San Francisco by way of the Horn in three months! He was active in the sugar, fish, wine and raisin trades, the mining of borax—through Harmony Borax Works and its signature 20-Mule Team Wagons—as well as land development. Mr. Coleman understood the dark side of life in lawless, gold-fevered San Francisco where vigilante justice was common. In both 1851 and 1856, vigilante committees were organized to restore order. William T. Coleman headed the 1856 group and became known as the Lion of the Vigilantes when accused murderers were executed, after a secret trial, for the deaths of a US Marshal and newspaperman. Coleman later moved his family to New York but again returned to California. In 1871, he paid $84,000 for 1,100 acres in the Magnolia Valley to Oliver Irwin. He later added the Forbes subdivision that became Coleman’s Addition. He hired Golden Gate Park superintendent and civil engineer William Hammond Hall (1846 – 1934) to lay out the subdivision. Thousands of trees and well-nursed gardens were planted. In 1872, the Marin County Water Company was incorporated with W.T. Coleman as president and chief stock holder. The company purchased the water rights on Lagunitas Creek and built a dam to create Lake Lagunitas. Three years later, W.T. Coleman stocked Lake Lagunitas with 20,000 trout! In 1887, Coleman sold ten acres in Magnolia Valley to the Dominican sisters contributing half the cost so that they might build a convent and school for girls. The following year, he and his partners opened the opulent Hotel Rafael. It was the apex of Coleman’s career. For in 1888, he was considered (but not nominated) as the Democratic presidential nominee. Soon poor decisions in his borax ventures would lead to financial ruin. Nevertheless, W.T. Coleman repaid his debts before his death on November 22, 1893. Today, Coleman Elementary School and Coleman Drive in the Lincoln/San Rafael Hill neighborhood remember the man who devoted so much of his energy to the development of San Rafael and Magnolia Valley or today’s Dominican neighborhood.